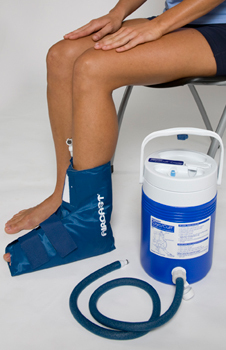 The Cryo/Cuff IC Cold Therapy System provides intermittent compression to minimize hemarthrosis, swelling, and pain. The Cold Therapy unit (w/ timed compression) arrived the day after my knee arthroscopy. (Surgeon indicated 4-6 week for recovery.) 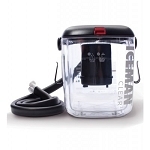 I have been using the unit for about ten days and it is really making a difference. I have been able to reduce my pain meds to only a couple of acetaminophen per day! When I realize the site is getting hot and swollen I add water and ice and let it massage my knee for twenty minutes. I know I'm doing too much but, it feels so much better than before surgery - this unit has really helped!